convention. This report will determine the seating at convention. Please get your membership transmittals sent in now. Share copies of the reports with your city officials and local newspapers. I still need 37 more members to take the American Legion Extension Institute in order to meet my goal of 150 graduates this year. This is excellent training for new offices, new members, and old members – it gives an overview of our organization. You can now take the class on-line through the national website for $4.95. It’s great interactive training which is enhanced with videos of our programs. Go to https://www.legion.org/alei to sign-up and complete. Encourage your new officers to take this class. If you already took the class with the four book set, I encourage you to also take the on-line class as a refresher. 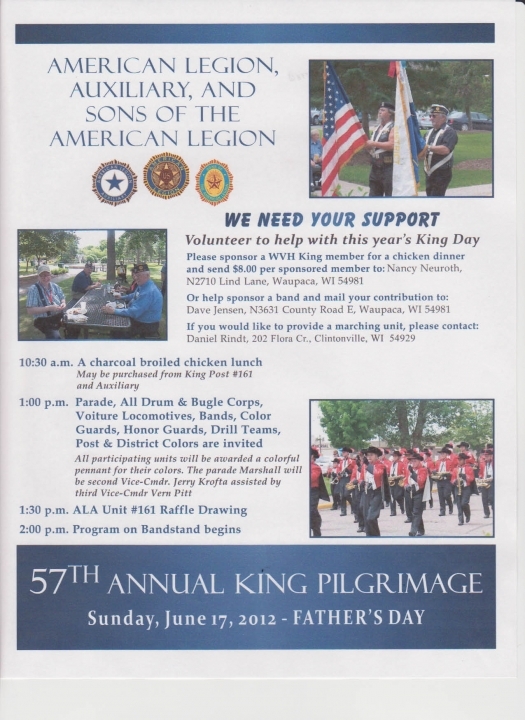 Finally, I hope to see many of you at King this coming Sunday June 17 when we make our annual trip to honor our Veterans who are residents at the King Veterans Home. This is a time to honor our veterans who may not have family to visit them on Father’s Day. Thank you for all you do, keep up the great work.